After assisting others to fight for their rights, labor rights consultant Zhang Zhiru found himself in their shoes and ended up staging a protest. On September 10, Zhang and his wife and children held placards on the streets of Shenzhen, Guangdong Province, in front of government departments. He claimed there was a campaign to refuse to lease housing to him in order to stop him from running an organization which aids factory workers embroiled in struggles with their employers in the Pearl River Delta. For the last 12 months, Zhang was constantly shuffled from one location to another, as the landlords were pressured to not lease housing to him. He has moved 10 times. 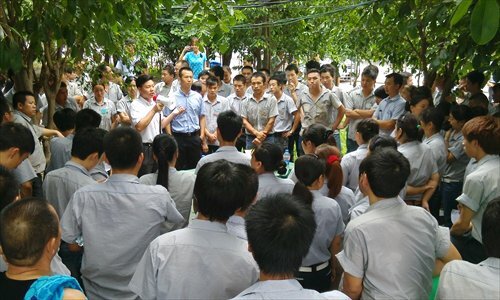 The situation has worsened since his organization, the Shenzhen Chunfeng Labor Dispute Service Center, coordinated a massive strike by Yue Yuen shoe factory workers in Dongguan in April. Now he has to move again before October 1. Though it's easy to find a new place again, he said the constant moving has affected his life. Worse still, it has made it impossible for his two children to settle down for schooling. Born in a rural area in central China's Hunan Province, he struggled between life on farms and factory workshops, shifting back and forth when he was younger. He dropped out of junior middle school at 15 in 1989, and soon after that he rallied the young people in his home village in Dongkou county to idealistically vow to "strive for a strong China" by developing the economy, inspired by the story of an enterprising village leader, Wu Renbao, who led Huaxi village to get rich. But lacking a specific plan of achieving that goal, and with no funding, Zhang went to Guangdong Province to work, in order to make money for his association. At that time there was no labor law, and Zhang saw many cases where workers' rights were being infringed and they were left with no avenues for redress. He then tried to establish an organization to defend the rights of migrant workers. "A Dongguan petitioner told me that such an organization would be illegal, and kindly suggested I establish a labor union instead," Zhang said. He then endeavored to establish a workers' union in the Taiwanese-invested factory where he worked and won support from the Shenzhen government, which welcomed this deed. But the attempt failed and he was dismissed by the company as a result. After the frustration, Zhang returned home and established a "youth cooperation team" to mobilize the young people in the villages. At that time, not many young farmers were leaving the village to work in cities. They rented farms and ponds to breed pigs and fish in 1997. However, the dramatic fluctuations of prices brought them severe losses, and not long after that, Zhang became a migrant worker again in Shenzhen. He was injured at work and fractured his clavicle in 2002. After failing to receive compensation from the factory owner, the idea of doing something for workers like himself burned inside him. But his attempts to found a workers' union never succeeded, and were routed either by the enterprise managers or the city's official Trade Union. Finally, an independent Shenzhen Migrant Workers Association was established in 2004. Like most non-governmental organizations, this association operated in a grey zone as no government department would take charge of it, which is a must in order to be officially registered and acquire legitimate status. "The government turned a blind eye as the association worked for the workers' interests, and we sometimes could cooperate with each other," Zhang said. However, the association organized two mass events in 2006 to collect signatures from thousands of people demanding the exemption of labor dispute arbitration fees, and this caused trouble for the organization. "The first time ended up with me briefly detained for disturbing public order, and the second time finished the association," said Zhang. Shenzhen authorities clamped down on the association in what local media said was "the biggest move in the city to bust illegal organizations." From then on, Zhang's team started to operate under the name of the Shenzhen Chunfeng Labor Dispute Service Center, which still had no official recognition and was registered as a company. They also began to accept funding from a US foundation. "I hesitated at that time [to accept foreign funding], but when the Shenzhen Migrant Workers' Association was put down, the original form of the organization crumbled and couldn't sustain itself unless we accepted foreign funding," Zhang said. Zhang's wife, Xiao Hongxia, was also a migrant worker in Shenzhen. On one occasion she and three coworkers were interviewed and their photo became the cover of the Time magazine as representatives of China's female workers. Zhang assisted her to establish an organization dedicated to supporting female workers' interests. The Nanfengchuang magazine listed Zhang among 10 prominent charitable figures in 2011. Zhang's struggles through the decades witnessed the improvement of China's labor rights protection, including the legislation of the Labor Law in 1995 and amendments thereafter. Earlier this year, Chunfeng joined dozens of similar labor rights organizations to condemn a few Hong Kong business chambers for interfering with Guangdong provincial legislation which was designed to empower the workers in negotiating their benefits with employers. Zhang stressed that his organization fights for workers' rights within the legal framework and using the current laws. The biggest problem with the labor rights protection is the laws are not observed, he said. However, he said there is still a gap between labor rights organizations and the authorities, as the local government views people like him with mistrust as troublemakers for the local economy who might deter investment. Sometimes, problems are more than simply mistrust. Once in 2011 Zhang tried to run for the district People's Congress in Shenzhen as an independent candidate, with the goal of having more say in labor law legislation. That endeavor ended when he was threatened and told to give up.